A long-running narrative about complexity has served as a storyline for many years in the communities that made distributed systems possible. For example, Microsoft recently announced that Azure App Service, a platform for creating Azure-based applications, now runs on Linux. The underlying infrastructure depends on Docker to run containers that are either built-in with specific stack versions, or developers’ own custom containers. By participating in open source communities and using technologies to abstract complexities for developers, Microsoft can provide tangible ways for developers to more easily build web applications. 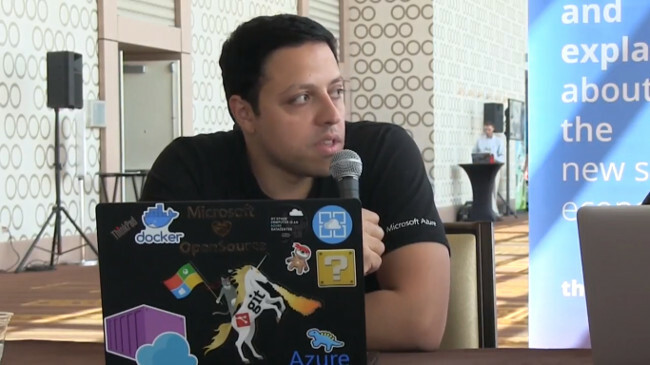 “It allows (developers) to deploy, run and scale web apps quickly without thinking about the infrastructure,” said Ahmed Elnably, Microsoft program manager, in an interview at Open Source Summit. Most cloud-native technologies are first adopted by developers and engineers who want to fix the underlying problems that come with the challenge of running multiple services on different types of infrastructure. They create their own services and often make them available as open source technologies. Over time, technologies such as Docker have become core to platforms. Back in 2013, Docker creator Solomon Hykes had described running services on different infrastructure as a matrix of hell. Today, we are seeing the realization of that movement with services built on open source technologies that use containers to provide a service that developers may use to build apps. 1:10: What is App Service on Linux? 1:37: Addressing why developers should be interested in the App Service on Linux platform. 3:21: The features Elnably enjoys most in App Service on Linux. 5:12: Exploring the history of containers and its impact on App Service on Linux. 8:10: How Docker plays a part in the App Service on Linux infrastructure. 10:05: Moving forward, what is the next stage of development for the platform?